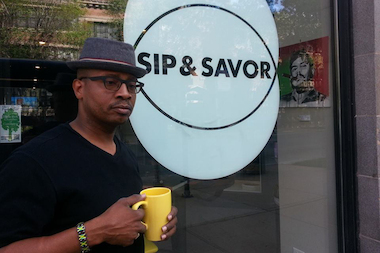 Trez Pugh III said he plans to revive his original Bronzeville coffee shop after opening Sip and Savor in Hyde Park. HYDE PARK — The former owner of the Bronzeville Coffee House is quietly working behind drawn blinds to bring back the cafe that was once a cultural hub for the neighborhood. He said he plans to resume selling coffee and baked goods to Bronzeville residents in June. He said his plan is to host jazz on the weekends, business networking events and possibly a karaoke night, all in a setting that’s a little ritzier than most coffee shops. “It’s going to be more high-end, it’s going to have a brighter feel,” Pugh said of the shop at 528 E. 43rd St. that he’s been quietly working on for eight months. Pugh's original Bronzeville coffee shop, which was a frequent spot for the neighborhood’s cultural and business leaders, closed in 2011 after a seven-year run of comedy showcases, poetry slams and the occasional speed-dating event. Pugh said it was too difficult trying to juggle the hectic business and his day job working for the federal government. “It just got to be too crazy,” he said. He said it was hard for him to sell the business, and got even harder when he decided to try the coffee shop juggling act again. In 2012, Pugh opened Sip and Savor in Hyde Park at 5301 S. Hyde Park Blvd., a more manageable version of his Bronzeville cafe that focused more on coffee and baked goods and less on events. Pugh said his old Bronzeville regulars quickly discovered he always worked weekends at Sip and Savor and would stop in to hound him about coming back north. When Netup Cafe closed in early 2013 after a two-year run in Pugh’s old building, he said he started to tinker with the idea of a more ambitious Bronzeville coffee house again. After eight months of quiet labor, Pugh is now getting ready to reopen in June, but this time under the name Sip and Savor Bronzeville. He said he’s already anticipating the name won’t stick in the neighborhood. “I’m sure they’ll still call it the Bronzeville Coffee House,” Pugh said. He said he’s OK with that.